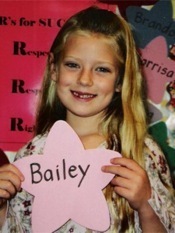 A unique and exceptionally loving child, Bailey brought joy to everyone she met. She was blessed with beautiful green eyes, long blonde hair, a wonderful smile, and a happy spirit. She loved to sing, tap dance, Hula Hoop, play soccer, go boating, and eat chocolate ice cream. At home, she delighted in spending time with her mom and dad, horseback riding, watching cartoons like SpongeBob SquarePants, swimming, and hanging out with her big sisters Amanda and Marissa, their puppy-dogs Shelby and Fudge Bar, and her doll baby Tiffy.